My new zig zag lights didn’t quell my hankering for zig zags, I wanted some more to finish off our bedroom and found this set of two cushion covers from Etsy seller Say It With Pillows. Along with these John Lewis value cushions in red and blue for £5 each, I now have enough zig zags and cushions in my life. I like that the zig zags on the cushions and lights are a bit different and don’t match exactly, do you? Sorry for the lack of posts in the last month or so, we’ve had a few sad weeks and I wasn’t hankering for anything that I could share with you here. But I’ve finally got my hanker back. It feels like we’ve been decorating our bedroom for months, it started off as 1970s hideousness. Brown carpet, huge brown fitted wardrobes with smoked mirrored doors to make it even darker, gold spotlights, peach vertical hanging blinds, leaded windows that made you momentarily think you were in prison upon waking and an Artex ceiling. To make it more brown we had some beautiful but massive teak Lombok furniture that my husband brought with him when we moved in together. We wanted rid of the brown and in its place a clean white room with navy and red accents. So once the ceiling had been skimmed, the double glazing replaced and the wardrobes removed we could think about the colour scheme. I had in mind chevrons or zig zags. 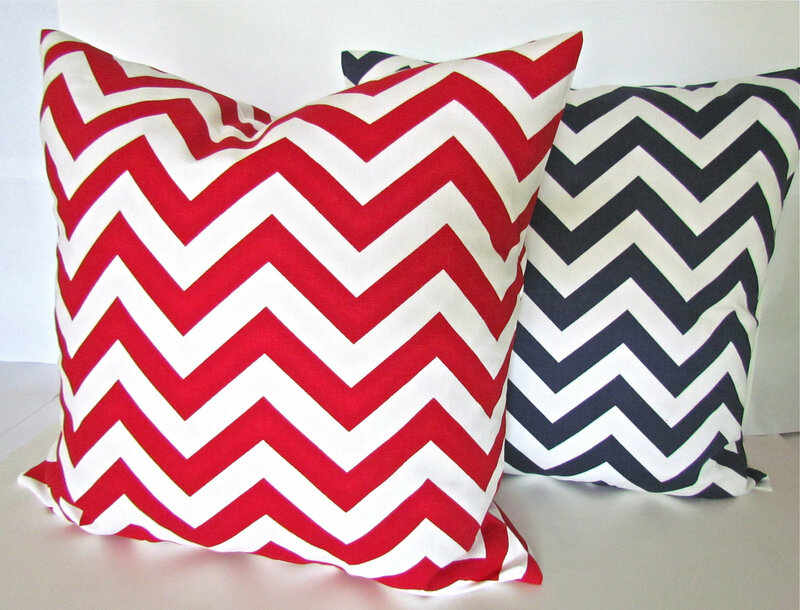 (Don’t know the difference between a chevron and a zig zag? Discover it here). 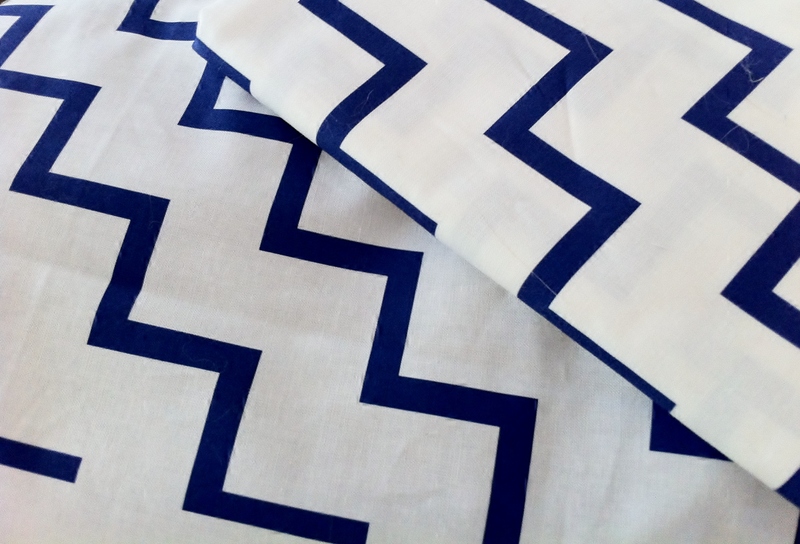 But after looking in all my usual places and more I couldn’t find any zig zag or chevron fabric in the UK that was just one colour on white, the few I found were a mish-mash of colours. It was while reading about Natasha’s wedding fabric on Writer Reader Baker Bride that I discovered Spoonflower, unlike Natasha I didn’t create my own fabric design but I did find the zig zags I was looking for. In my excitement at ordering samples, I totally missed that Spoonflower are based in the US and it wasn’t until a couple of weeks had passed that I looked back at the website and found out. So it did restrict how much I ordered as I wasn’t sure if Her Majesty’s boys at Revenue & Customs might whack a little extra on when it arrived in the UK. But when my three yards arrived less than two weeks later it came straight to my door. The fabric was for lampshades, I wanted two small shades over the bed instead of bedside lamps and a big lampshade in the centre of the room. 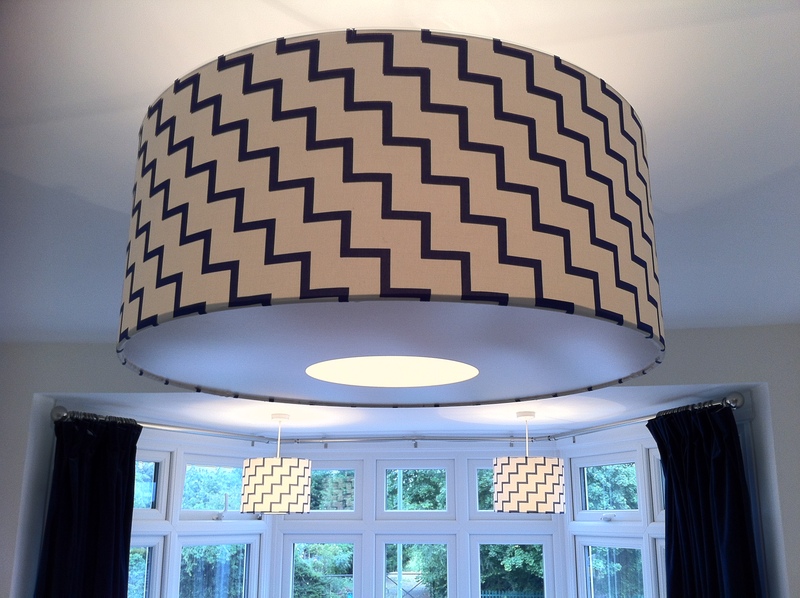 As I’d never tried making lampshades before I bought two small kits from Needcraft and thought I’d make them first to figure out how to do it and then bought the parts to make a big drum shade 70cm in diameter. They were surprisingly easy to make, if a little fiddly getting the fabric on straight. It reminded me of covering my school books with sticky-backed plastic as a kid. Talking of school, I made the schoolgirl error of cutting the fabric for the small lampshades from the wrong edge of the fabric which meant I didn’t quite have enough for the big one and had to fill it in with a patch, which caused a fair amount of swearing at the time, but you can hardly tell now it’s up. If you’re wondering how to make a lampshade you can watch a video here.